Over the weekend, I went a little crazy with my Silhouette Cameo. If you remember, I bought this thing over 6 months ago. And believe it or not, I have not done any vinyl cutting with it until this post - and then again over this weekend. Using vinyl with the Cameo is ADDICTING! I seriously want to vinyl over everything -its so easy and fun. That is why I vinyled three sides of my fridge this weekend - after this - the Hubby said "Please, stop with the vinyl before you put some on the toilet or the bottom of the sink" (which by the way - is a GREAT idea! ;-) ). So I got out my Cameo, vinyl, and transfer tape and went to town doing some simple projects. 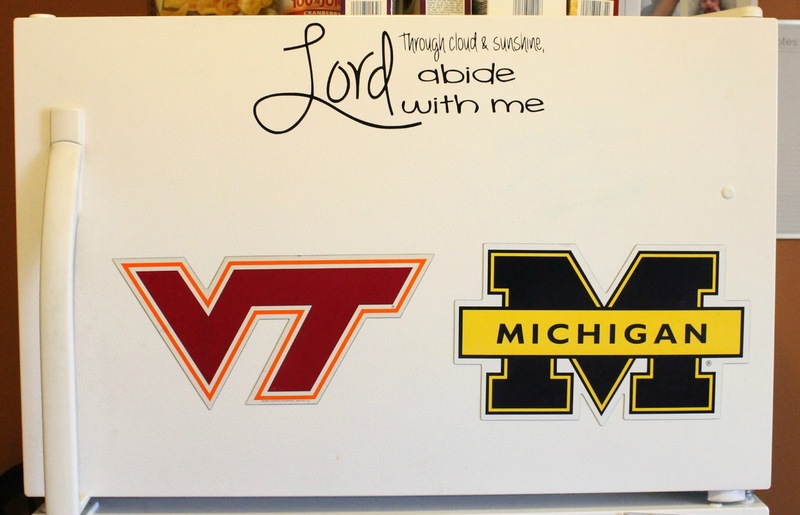 On the front of the fridge which I look at too MANY times in the day - I put this quote from an amazing hymn called "Abide in Me" (click here to listen). This helps remind me that Jesus is with me - through cloud and sunshine, tears and smiles, spills and messes, failures and successes. On the "business" side the fridge (the coupons, menus, phones numbers, groupons, etc. ) 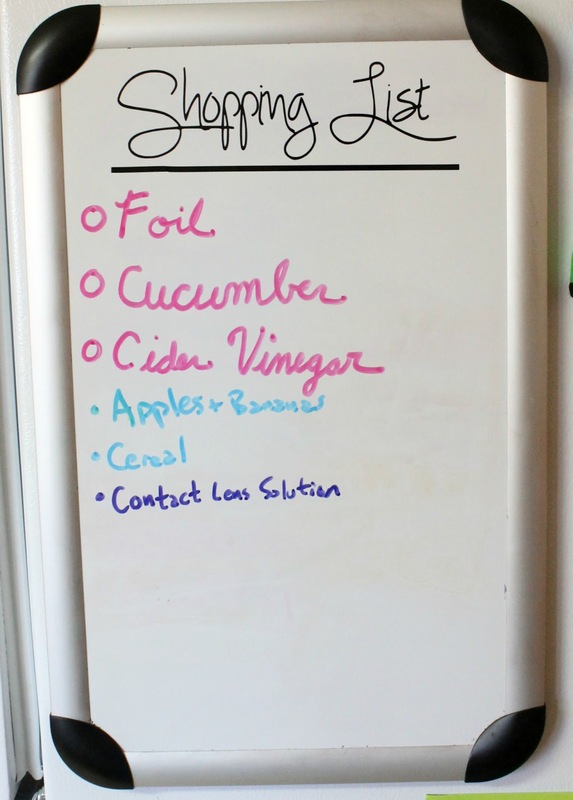 I put some vinyl lettering on my shopping list board. It looks so much better than the dry erase marker that always kept coming off. And finally on the other side I put the words "PRAY". 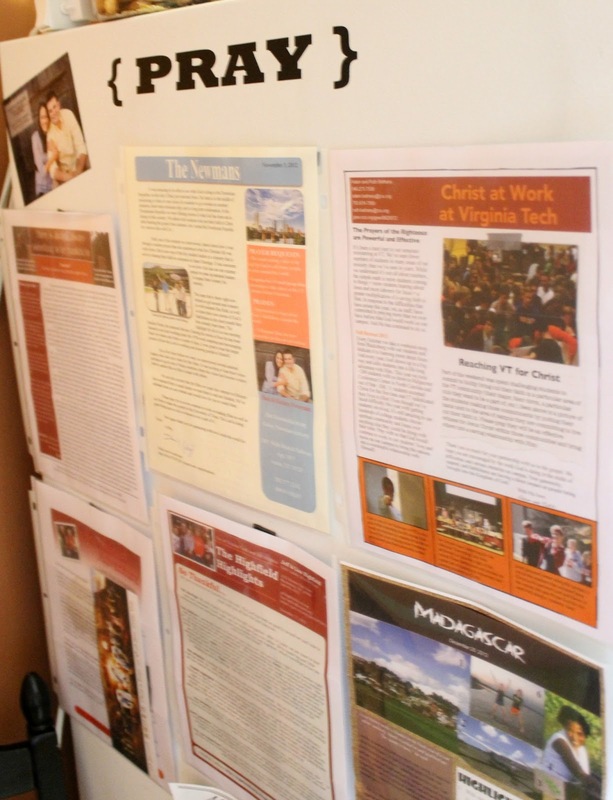 On this side of the fridge I put all the newsletters from our missionaries, friends, and Compassion children we support through prayer. This reminds us each morning at breakfast to pray for them and their ministries. Ahh.. It feels so good to vinyl. I can't wait for my next project that will call for vinyl!